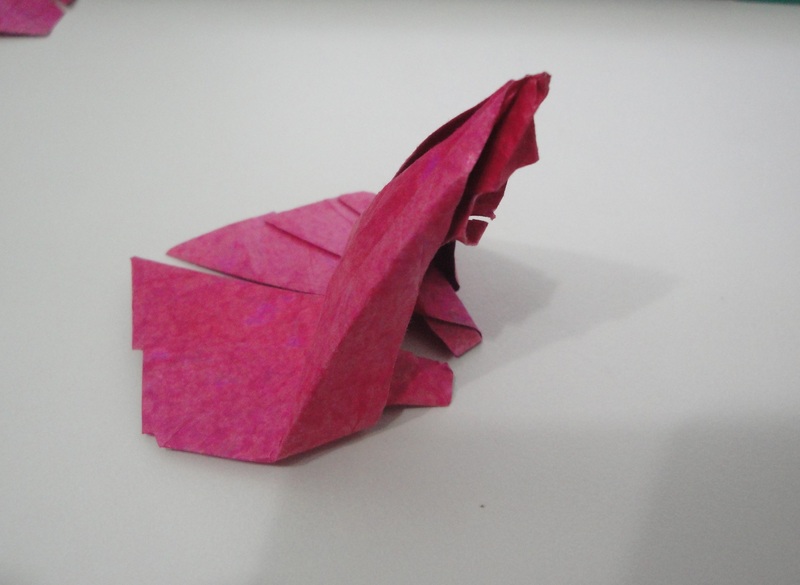 The Origami Forum • View topic - What do you think of my model? What do you think of my model? This is my first design. I came across it while free folding before class. Once I got home, I refined it and made the diagrams. I'm not happy with the feet, though. No matter what I do, I don't really like the end result. If anyone can help me make it better, I'd appreciate it. Re: What do you think of my model? OK, on step 21 it looks to me like a kneeling oriental person like from the past. Was it something like that that you created? I hope I'm not offending you with my lack of perception , if it isn't the case. If it is that, then I don't understand why you chose that angle for the picture. I can only see what I assume to be the cape and his feet (I meant knees -correction-); nothing more. I'm surprised about the great diagrams! So you learned how to diagram long before you started creating ? Last edited by Gerardo on July 1st, 2016, 4:32 pm, edited 2 times in total. OK, on step 21 it looks to me like a kneeling oriental person like from the past. Was it something like that that you created? I hope I'm not offending you with my lack of perception , if it is the case. Now that you mention it, I can see your point. But the model doesn't stand up until you fold the layers to the back, so that surely wasn't what I had in mind. Oh, and don't worry about offending: I once transformed an origami tree into a Santa Claus face, so I'm really fond of creative perceptions. I can only see what I assume to be the cape and his feet; nothing more. The model is like a T-rex, with disproportionate small arms in comparison to the rest of the body. You can see 2 curvy flaps just below the head - supposedly, those are the arms. I failed a bit on Step 8 when making the model of the picture (too small of a square), so the cape ended up being smaller and falling behind the arms. If it was bigger, it would cover part of the arms and give the impression of someone with crossed arms, holding the cape as a cover. I've used Inkscape in the past, both for diagrams and non-origami related stuff. That's why it was easy for me to create good diagrams for this little model.